The numbers are still coming in after polls closed over the weekend in Iraq’s first election since defeating the Islamic State (ISIS) late last year. And they are pointing to a shock win for firebrand Iraqi cleric Moqtada al Sadr, who wasn’t even running for prime minister, along with his coalition allies, the Iraqi Communist Party. He is followed by Iran-backed Shia militia leader Hadi Al Amiri, while incumbent Prime Minister Haider Al Abadi, initially predicted to win re-election, trails in third. Voter turnout was a low 44.5 percent, indicating widespread voter apathy and pessimism, observers said. The early polls come from a document provided to Reuters, however the news agency was unable to independently verify the information. Who is Moqtada al Sadr? A win for Sadr, the populist Shia leader known for his anti-American campaigns and his populist appeal to Iraq’s young and poor, could dramatically change Iraq’s political landscape and its relationship with external powers like the U.S. and Iran. In addition to pushing for the removal of U.S. troops from Iraq, Sadr is avidly opposed to Iranian influence in his country. That influence has grown significantly thanks to the pivotal role played by Iran-backed militias in driving out ISIS. The influential leader, who has millions of religious followers, cannot become prime minister as he did not run for the position himself — but his electoral success means he will likely have a key role in deciding who does. Sadr has spearheaded a number of political movements in Iraq, gaining infamy for directing attacks on U.S. troops in the wake of the 2003 Iraq invasion. His charismatic sermons have drawn hundreds of thousands into the streets over a range of causes. More recently, he’s led campaigns and protests against corruption within the Shia-led government as well as against Iranian influence, and pledged to overcome sectarianism by leading a secular coalition that includes Iraq’s communists. Sadr in 2003 created the Mahdi Army, which executed the first major armed confrontation against U.S. forces in Iraq led by the Shia community — and it posed such a threat that U.S. forces were instructed to kill or capture him. The group, which numbered up to 10,000, was also accused of carrying out atrocities against Iraq’s Sunnis. It was disbanded in 2008, but re-mobilized in 2014 to fight ISIS. The cleric owes much of his religious following to the legacy of his father, an influential Iraqi ayatollah murdered in the 1990s for opposing former President Saddam Hussein, and has spent much of his career championing Shia causes. But in the last year, he’s undergone something of a reinvention: he has reached out to Sunni Gulf allies, most notably in 2017 visits to Saudi Arabia and the United Arab Emirates, where he met with Saudi Crown Prince Mohammed bin Salman. The Gulf Cooperation Council (GCC) powers typically shunned Iraq’s Shia, but are now making headway in the country through investment and economic aid, seen partially as an attempt to counter arch-rival Iran’s entrenched influence in the country. Ahead of the election, Sadr pledged a commitment to abandon sectarianism by forming a coalition with secular Sunnis and Iraq’s Communist Party, who have as a result seen their best election performance ever. 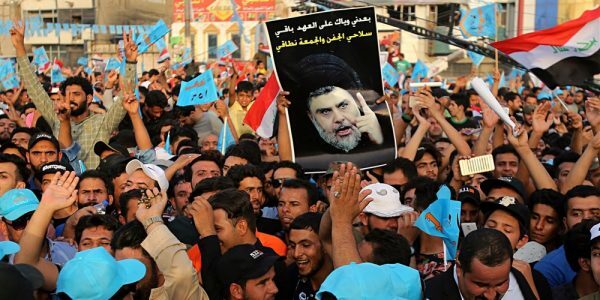 “Sadr’s strong showing suggests that he maintains a relatively loyal following and that his nationalist, cross-sectarian platform was effective at mobilizing voters in challenging conditions,” said Ryan Turner, a senior risk analyst at London-based PGI Group. Because of the fractured nature of Iraqi politics, no candidate or bloc has won an outright majority. The winners of the most seats must negotiate a coalition government within 90 days, during which a long complex process of compromise will have to unfold. Winning the greatest share of votes does not directly translate to leading the government. 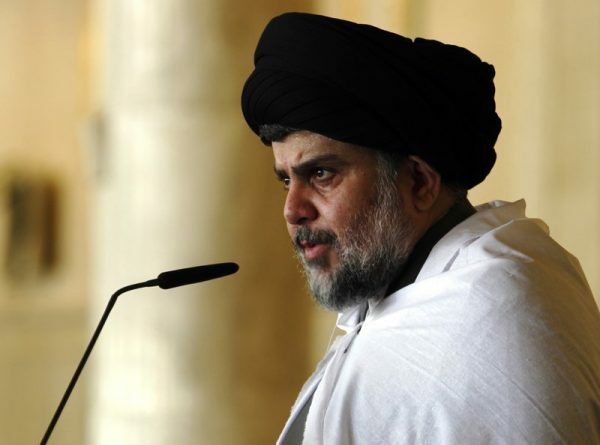 “Depending on the final tallies and political jockeying, Sadr may find himself in a position to play kingmaker, which could see Abadi reappointed prime minister,” Turner said, referring to the current prime minister, who was widely praised for leading the fight against ISIS and for balancing relationships across sects and external powers. But to do so, Sadr would likely have to outmaneuver Iran, which would prefer to see Amiri — the candidate poised to finish second place — assume the premiership. Tehran wields much of its influence by pushing its preferred policies through Iranian-backed candidates and political players like Amiri. A major objective of Iran’s is to push the U.S. out of Iraq, where some 5,000 troops still remain. Labeled one of the most corrupt countries in the world by Transparency International, Iraq is still mired in poverty and dysfunction following its bloody, three-year battle against ISIS. Officials estimate they’ll need at least $100 billion to rebuild the country’s destroyed homes, businesses and infrastructure, and improvised explosive devices and landmines remain scattered throughout the country. The composition of the new government will be crucial in determining how Iraq moves forward. This is a good thing. Sadr is a nationalist and is not interested in Iran taking over. Like the US has done in the past, it will leave when asked to leave unlike Iran which is interested in setting up Iraqi Hezbollah armed groups to push their influence. This is why Iran is unwanted in the new Iraq, because it wants to control Iraq through proxies and forced sectarianism. Let’s hope you’re right. But it’s really hard to trust one brand of Islamofascism to effectively fight another one.